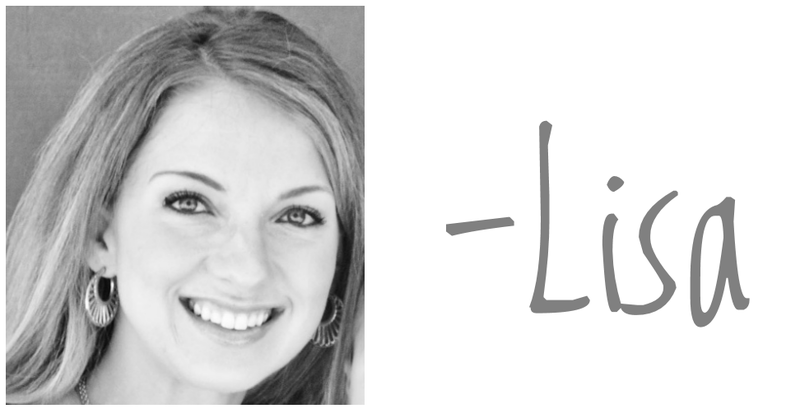 I’m Lisa—an accountant/mom with a passion for personal finance. I help people whip their finances into shape. My husband's co-workers can't get over the fact that we go on a date EVERY week (alternating between at-home and going-out date nights). He gets comments like, "What do you DO week after week?" Honestly, I understand their confusion because a couple years ago, I would've said the same thing. 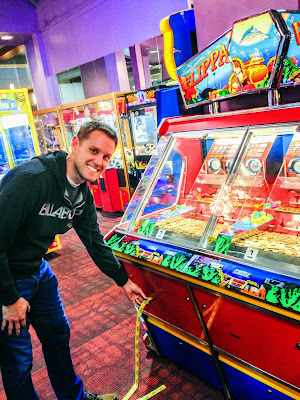 But since date night has morphed into this new and amazing thing--so different from what our date nights used to be--I don't know how we used to live without it. 1. 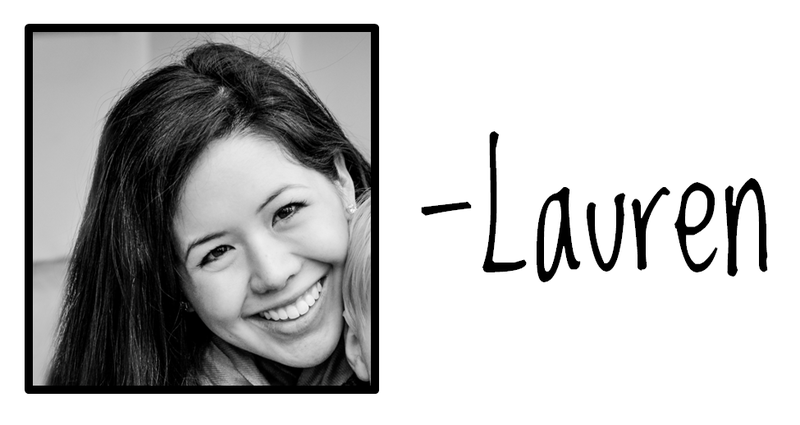 Our spouse is the most important human on the planet. Our relationship with them will affect every other aspect of our happiness, including our children and family as a whole. Our relationship thrives when we set aside time to communicate with each other. 2. 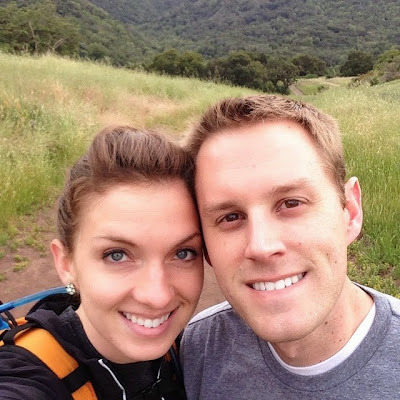 We both need to unplug and get stress-free time away from our work, routines, technology, etc. 3. It's too easy to get caught in the thick of thin things and never take time out to evaluate our lives, goals, and dreams. What better time to discuss our "big-picture" plans than with our most trusted friend and advisor? First of all, if doing date night at home is effective (or more affordable) for you, I FULLY support that. Own it. Discuss with your spouse how to make at-home date nights most meaningful. Personally, I find that my mind and body are able to relax and rejuvenate more effectively when I leave my job site, which happens to be my home. You know I'm a budgeter. Hard-core. But budgeting is NOT about spending as little as possible on everything, it's about putting your money towards whatever is most important to you and letting other things go. Date Night is a priority for me, so I am willing to give up other things (clothes, home decor, vacations, etc.). For me, the most enjoyable dates are the ones that allow us plenty of time to talk while trying fun, new things together. (1) These babysitters are background-checked AND vetted by other families. You can read reviews about them and/or link your social media accounts to see which babysitters your friends recommend. (2) You can scroll through a list of babysitters and check out their profiles, including a video of them. If a picture is worth a thousand words, a video is worth a million. (3) You can schedule online. (4) YOU CAN PAY BY CREDIT CARD. As someone who lives for my 2% cash back, this was awesome. If you're interested in trying out UrbanSitter, they're hooking up our MHM readers with a free month of membership--use the code FORFREETRIAL. And that, my friends, is why I love date night. What's your idea of a perfect date night? You enter information into the pink boxes ONLY. The rest of the spreadsheet will populate from the information you enter there. Notice the spreadsheet has two tabs: (1) a blank tab and (2) an "example" tab with hypothetical inputs so you can get an idea of how to use the tool. Once you've entered the information in the pink boxes, the result is a variety of possible medical cost scenarios in a year, from very low cost (a handful of doctor's visits in a year) to higher costs (like the need for some X-rays or something) to much higher, like pregnancy or surgery. You can play around with these assumptions if you want to. This spreadsheet is useful for comparing plans that differ SOLELY in terms of costs (monthly premiums, copayments, deductibles, etc.). If plans differ in terms of conditions covered then this won't help you choose between them, but the good news is that plans now seem to be required to cover pretty much the same stuff. People should have a good idea of what they personally need covered so before they buy a plan I would advise everyone make sure to get a detailed plan summary and look for the type of care they need and see what it covers. 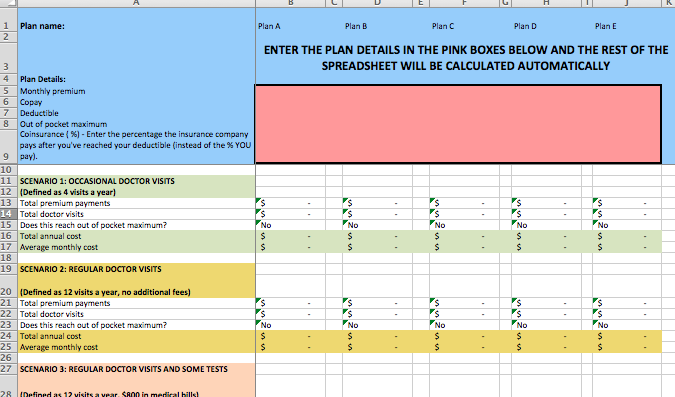 The beauty of this thing is that when you're comparing plans that are substantially equal except in terms of cost, you can just plug in the pink box numbers and boom, you know which health plan is actually cheapest. I spent several hours making the spreadsheet earlier this year but my decision process took like 5 minutes. Also, in my experience, the middle of the road plan is usually the best value. That's the one with the middle premiums and the middle deductibles. It seems to end up being cheaper overall because the low premium plans have higher deductibles (and the amount you save on premiums doesn't often make up for the higher deductible unless you know that you're going to go to the doctor just like once or twice a year) and the high premium plans with the low deductibles are usually so much more a year in premium payments that the lower deductible doesn't do you as much good as you think it might. But it's always good to run all the numbers to be sure. (1) Request details of what the plan covers and what it does not cover. The company may not give you all of this information up-front, but when you read more details you may see that a plan that claims to have a $30 copay for a regular doctor's visit actually has a higher copay for certain other services. Or you may see that the emergency room copay is different or that there is a separate deductible for maternity. Or that the plan covers chiropractic services at the regular $30 copay but limits you to 12 visits a year. Each family should already have some idea of what services are going to be relevant to them, but some things to think about would be the coverage for emergency room, maternity, autism or other child development services, mental health, chiropractic, and prescription services. (2) If you take certain prescription drugs regularly (or anticipate needing to take certain drugs in the future, such as if you get pregnant), ask whether the plan covers those specific drugs. It doesn't do much good to buy a plan where prescriptions only cost you $10 if none of the drugs you take are included. (3) If you are attached to the doctors you currently see, call their offices and ask if they accept an insurance plan you are thinking about buying. When I did that last December I found out that none of our regular doctors were going to accept any of the Marketplace ("Obamacare") plans. I've always loved St. Patrick's Day. Really--what's not to love? Just when I thought life couldn't get any better, I up and had my first son on St. Patrick's Day. Dream come true. 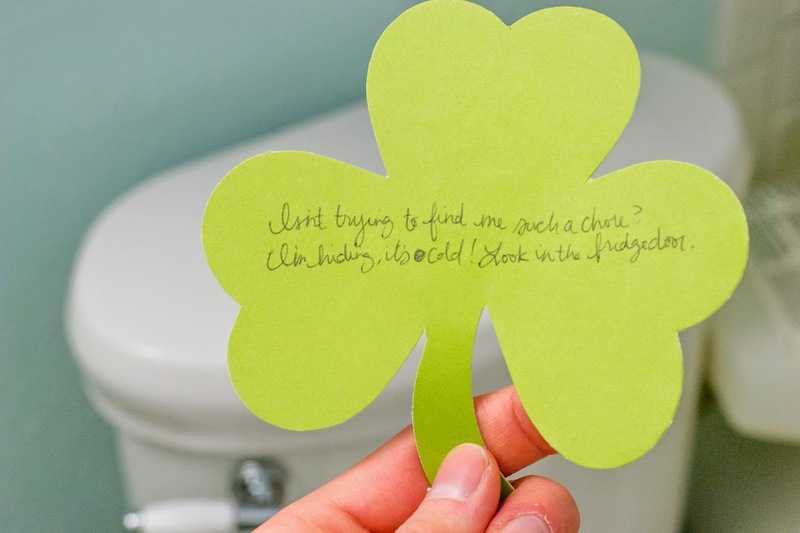 For this last birthday, we invited all his little friends over for a St. Patrick's Day Leprechaun Hunt. 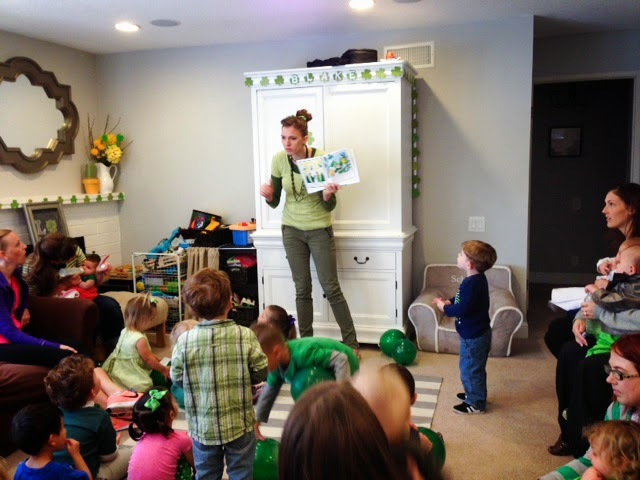 His birthday was combined with our "Toddler Time" play group that usually involves reading a book, so we started by reading a book about St. Patrick's Day. P.S. That intensity on my face is not feigned. I'm that serious about everyone loving St. Patrick's Day. 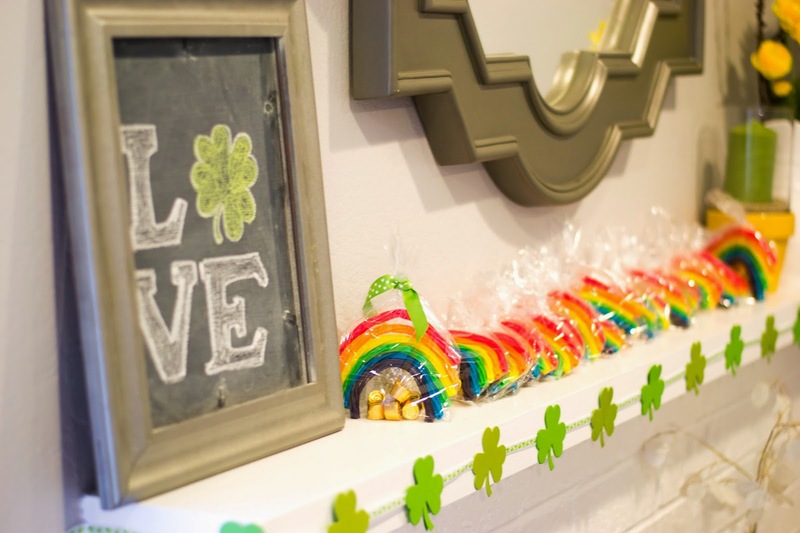 The book explained the tradition of leprechauns and how if you can catch them, they'll give you their pot of gold. 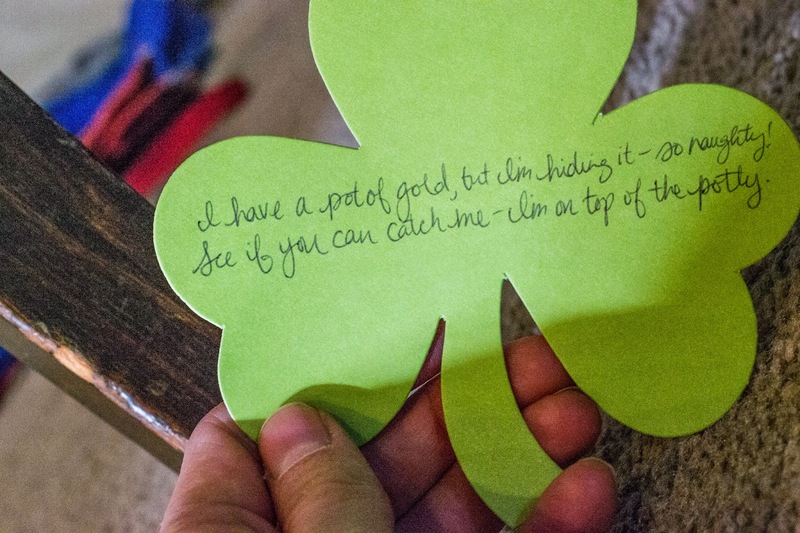 We spotted our first clue and were off to find that leprechaun! Our house is small, so I purposely alternated clues that brought us from one side of the house to the other, so it felt like more of an adventure than it really was. 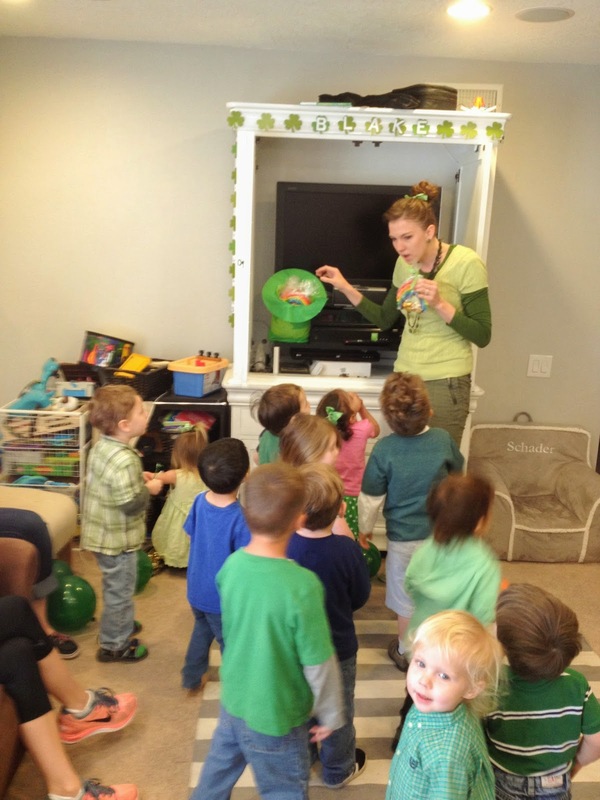 The best part about the leprechaun hunt is it's great for all ages. The big kids understood the clues and the thrill of the hunt. And even the tiniest toddler got caught up in the excitement and had fun running around, chasing after the big kids. So into the hunt--searching for clues. You can make up your own clues like I did, but in case you'd rather copy and paste, these are the clues I came up with (pure poetry, I know). 1. (Placed out in the open): "Come try to catch me, if you are able--I'm hiding underneath the kitchen table." 2. 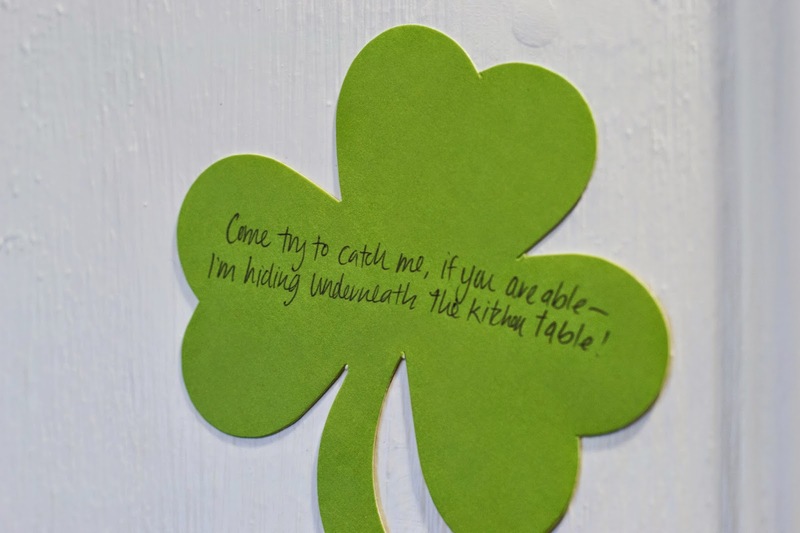 (Under the kitchen table): "I dance little jigs--I'm Irish, not French. Come try to find me under the piano bench." 3. (Under the piano bench): "I have a pot of gold, but I'm hiding it--so naughty! See if you can catch me. I'm on top of the potty!" 4. (On the wall above the toilet): "Isn't trying to find me such a chore? I'm hiding--it's cold! Look in the fridge door." 5. (In the fridge): "Did I tell you my name? I'm Leprechaun Stevie. I'm tired of running, come look by the tv." 6. 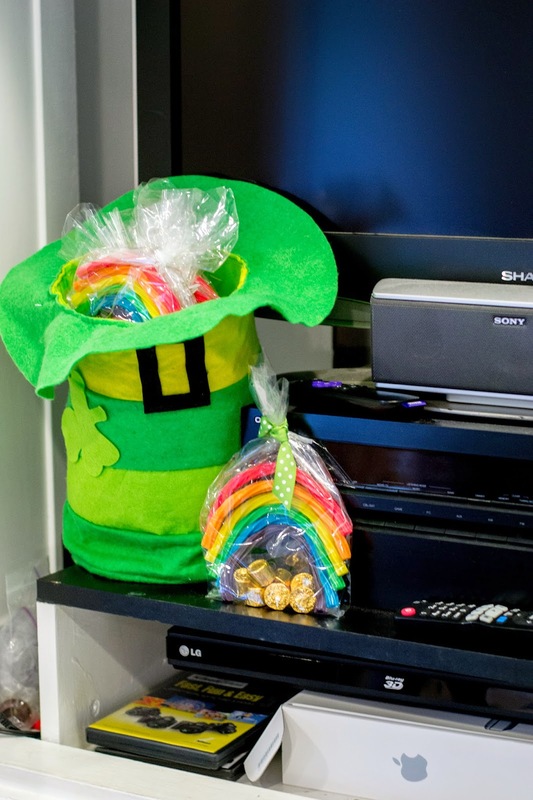 (Hidden by the tv, next to the pot of gold and/or treats): "You're such a good leprechaun hunter--so fast as so bold. I went home now--you missed me--but I left you my GOLD!" The kids were pretty jazzed about the individual treats. I'm seriously not crafty at all, but even I was able to handle this one (thank you, Our Best Bites!). Place Rolos in cellophane treat bags (I bought these bags). 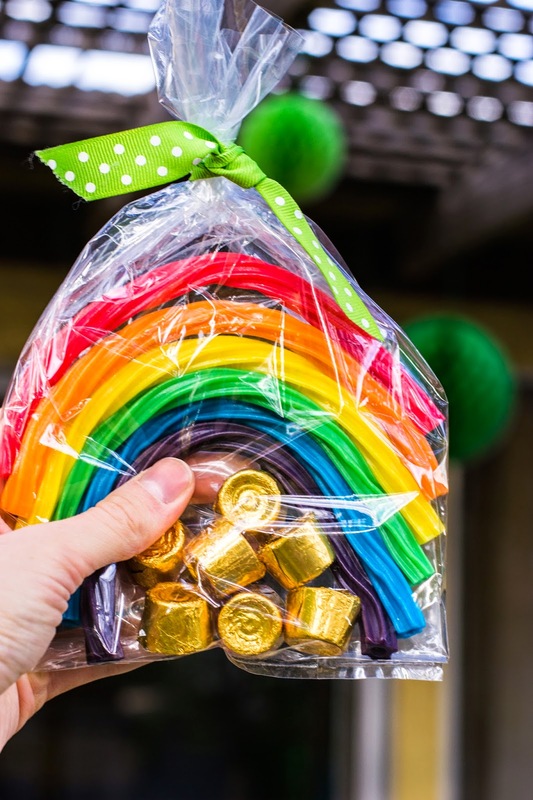 Place rainbow of Twizzlers (if you're striking out at finding them at Target, you can always get this 6-pack from Amazon. You'll need more than one bag anyway to make sure you get enough of all of the colors). 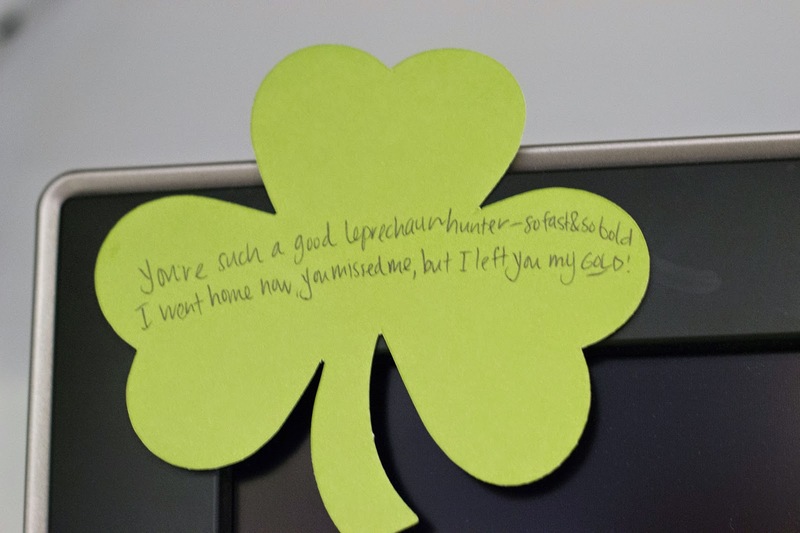 Good luck with your Leprechaun Hunt! Let me know if you have any questions and I'll get back to you ASAP. Congratulations on making it through a year of our Budget Boot Camp! We've slogged through tracking expenses, creating your budget, and trimming expenses to make the numbers work, and now you are ready to go on with your life with some serious budgeting skills. 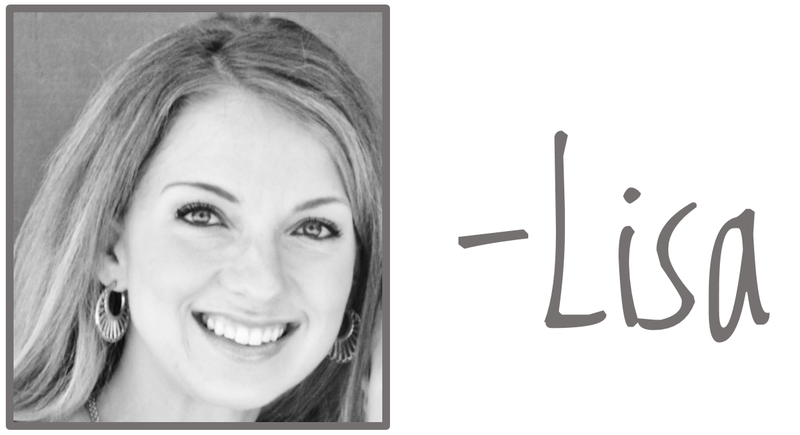 Lisa and I feel like budgeting is foundational to all other areas of personal finance. And while it's discussed frequently, it never seems to get addressed as thoroughly as it deserves. What if I don't have money to save for retirement? How do I open a retirement account? The information presented is to the best of our knowledge, but does not specifically take into account your personal situation. We cannot provide the specific guidance that your personal tax advisor can. We are not responsible for the results of reliance on the contents of this blog and articles herein. 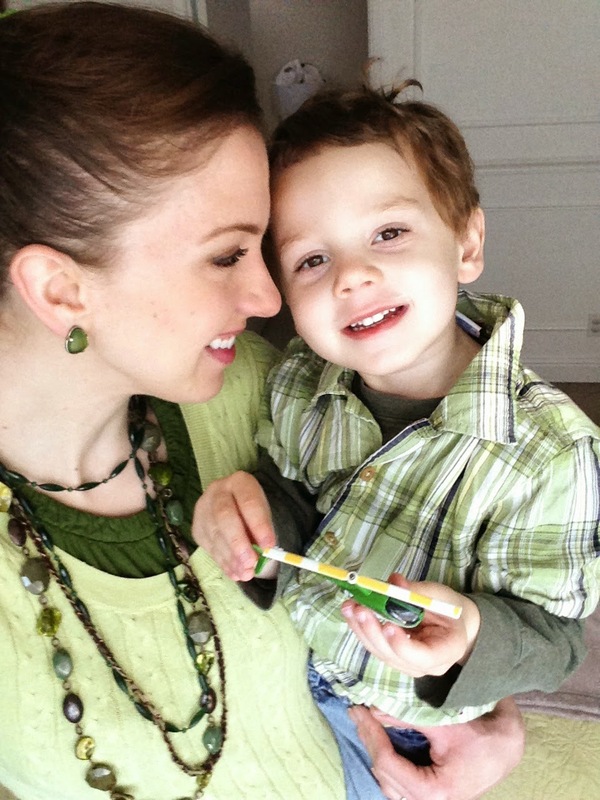 Money Hip Mamas is a participant in the Amazon Services LLC Associates Program, an affiliate advertising program designed to provide a means for sites to earn advertising fees by advertising and linking to Amazon.com. The whole project is so easy, it's ridiculous. Step 2: Cut out a 1.5" circle (I did use this hole punch to speed things up, but you could use scissors). Step 3: Fold printable and place on bottle. Step 4: Put your feet up. Because you're done. You're welcome. Need the printable? Like us on Facebook and then download this printable for free! 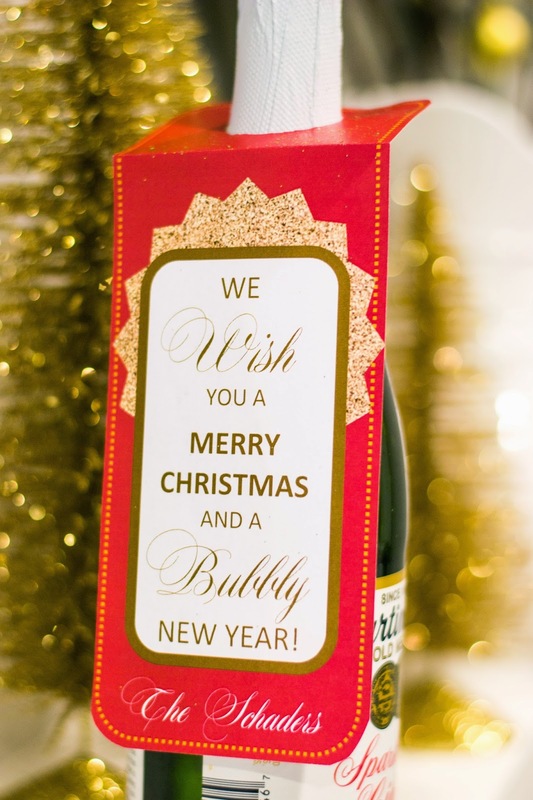 Anyone have ideas for easy neighbor gifts? I need ideas for next year! It's been forever since I've compiled a list of my new favorite things. And lately, every time I've been using one of the below items, my head explodes with a chorus of, "This is AWESOME. People need to know about this." So maybe you already know about all of these things. If not, you're welcome in advance. (3) Listen to them while you're getting ready, driving, or cooking. Last week, I started making dinner when my 3-year-old demanded hearing a "story" (podcast) on my iPhone. p.s. Any other podcast listeners out there? I'd love any recommendations. If you use the iPhone earbuds, I have no idea how you live without these. Last spring when I started running again, I began an intense search for the right earphones. One criteria I had was an attached microphone and control button (did you know you can use that button to pause/skip/go back while listening to music?). Anyway, after buying and returning a couple pairs of earphones, I realized what I really wanted was my good old iPhone earbuds, but I wanted them to actually stay in. Enter the EARBUDis. 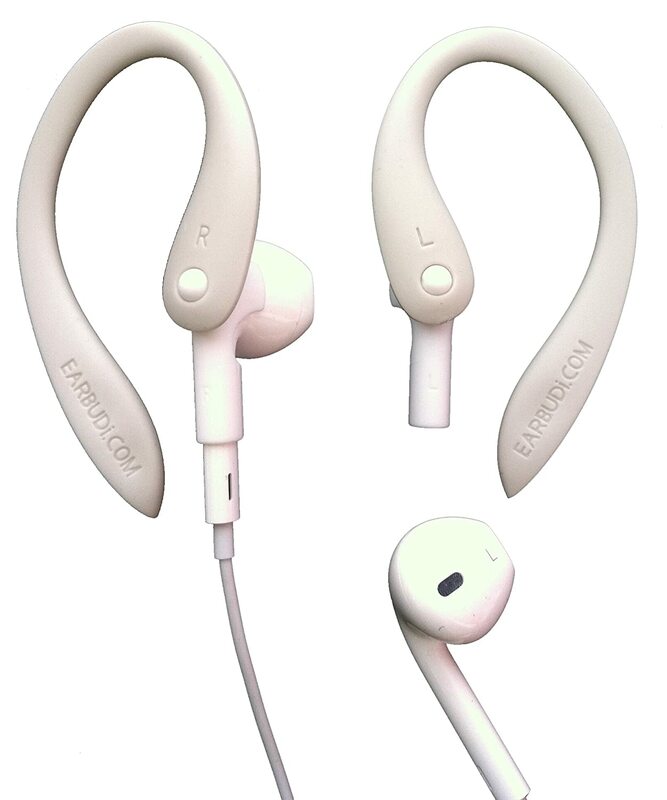 They attach to earbuds and keep everything perfectly and comfortably in place. My only complaint is that they have a habit of disassembling when they're rattling around in my (super messy) purse. But as long as I have them in a pocket, they stay intact. They're not fancy, but I've had them for over eight months now and they're still going strong. I can't stand using earbuds without them. This is the best for babies switching to sippy cups. My sister recommended this when my little guy was having a hard time making the switch. Worked like a charm. They have several designs available (I kind of wish I had a girl because the Hello Kitty design is the cutest). My little guy loves his Nuk Active Cup. But you probably shouldn't trust his judgment because he also prefers this ratty bear to all the new, nice bears given to him to try to replace the ratty one. 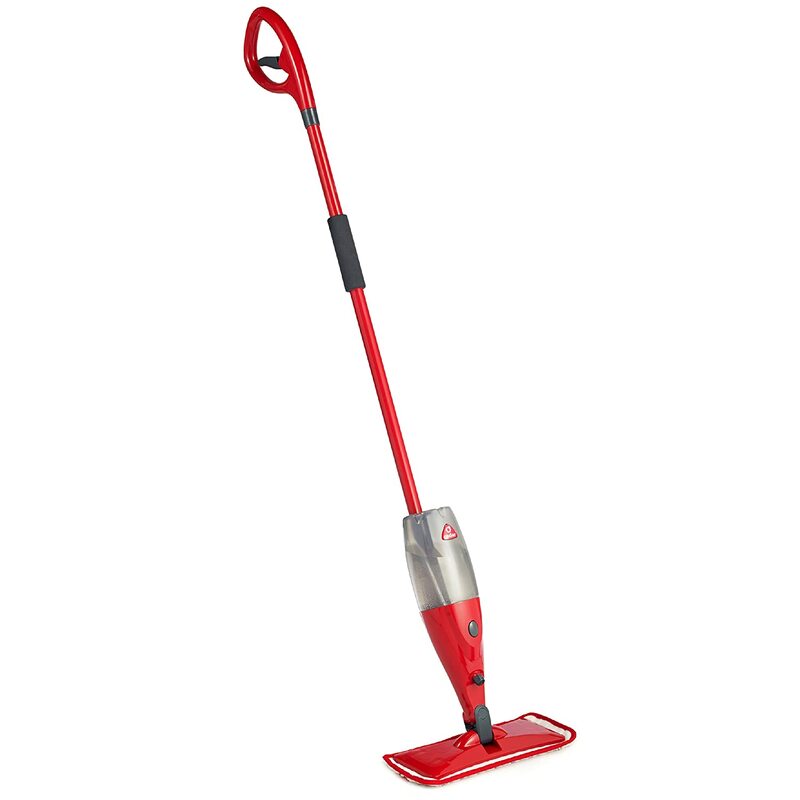 Besides the fact that the ProMist has a superior design, I'm sold on it because: (1) It has washable pads (as opposed to overpriced one-use pads) and (2) you can use whatever cleaning solution you want. Cha-ching! I did end up buying a spare refill pad since I only do laundry once a week. I'm happy with the ProMist. It cut my mopping time (over my old sponge mop) by 75%. Okay, maybe I was the last person on earth to organize their spice cabinet, but since buying this baby, I'm pretty sure I've gained hours of my life back. Seriously, I just did the math-- if you spend 2 minutes a day digging around for the right spices, that's over 12 HOURS per year. I can't believe I used to dig around my spice cabinet like a sucker. It comes in several different sizes. Whether you buy this or not, I highly recommend organizing your spices somehow. I think my blood pressure dropped significantly since I did. And that's it! Write any questions in the comments below or on our Facebook page and I'll get back to you ASAP. What products have you discovered lately that you're loving? Pin this article for later here. This is not going to be a regular list of suggestions about dropping cable and eating out less. If you've read one of those articles, you've read them all (our list is at the bottom of this link). The truth is, if there was an easy way to save money, you'd have already done it. Who doesn't like saving money? The purpose of this article is to help you figure out what matters to you and to convince you to let the rest go. Budgeting is not about blindly slashing as many expenses as possible, it's about making conscious choices about what matters most to you personally and spending accordingly. By the time you're done reading this, you'll know exactly what changes (if any) you need to make to your spending. Step 1: What Does "Rich" Mean To You? One of the best takeaways I got from the book I Will Teach You To Be Rich is that it's important to first figure out what "being rich" means to you. If you were rich, what would it look like? Maybe you want be able to take a trip to Disneyland every year. Maybe you couldn't care less about vacations, you just want a home with a yard. Or all of your kids in piano and dance lessons. Or a weekly date night. Maybe what you really want is to have a room full of gold coins you can swim in daily à la Scrooge McDuck. Whatever your goals are, write them down. The more specific, the better. It's okay to pick more than one, but make sure you order them from most to least important. Being rich isn't about having it all, it's about having what matters most. Note: I know "Saving for Retirement" probably wasn't on your list of financial priorities, but unless one of your goals was to "work like a dog until the day I die," you should go ahead and add retirement savings to your list. How much should you be saving towards retirement? I'm going to throw out the guideline 15% of your income and refer to my favorite article about saving for retirement. For each financial goal, figure out what it would cost you per month. Annual income: $50,000 x 15% = $7,500 per year / 12 months = $625 per month. Example: Piano Lessons for kids. $75 per month x 3 kids = $225 per month. $1,200 / 12 months = $100 per month. (I'll be honest--I just threw $1,200 out there. I live in CA and my sister works for Disney, so feel free to hate me for how economical Disneyland trips are for us). From our last Disney trip. Yes, I'm a grown adult and yes I wore that crown in the park. Now whip out your budget and figure out where you stand. How close are you to being able to achieve your goal(s)? What could you do to make it work? For some reason, trying to cut expenses arbitrarily (just because it's good to cut expenses) isn't very motivating. But if you have something specific you're working towards, cutting expenses suddenly becomes a meaningful, motivating goal. Look are your budget line by line to analyze your spending and then pick some easy targets. Maybe you really want that Disneyland trip and you're spending $125 a month on random shopping trips. Done. Now the next time you want to buy yet another purse you don't need, you're not denying yourself by not buying it, you're making a conscious choice to go to Disneyland instead. Maybe you'd be willing to ditch cable so you can put your kid in gymnastics. It's all about trade-offs and priorities. So pick your goals, pick which expenses you're willing to cut back on or eliminate and get to work. Maybe you are already in debt or you've already eliminated all discretionary spending (eating out, shopping, clothes, vacations, memberships, cell phones, etc.). Now it's time to look at the bigger expenses. Can you live in a more affordable apartment or home? Or maybe it's time to look at last month's Budget Boot Camp ideas for increasing income. It may take putting a long-term plan in place, such a getting additional education for a better job, but you can make it work. Have any questions? Need help figuring out how to reach your goals? Comment on our blog here and we'll get back to you ASAP. p.s. My product recommendation of the month is my mattress pad heater because it's getting chilly out there. I've had mine for years and years and I'm still obsessed. Copyright Money Hip Mamas. Powered by Blogger.